My Australian friend came to Japan mainly for snowboarding with renowned Japanese snow. I joined him for my first snowboarding experience! 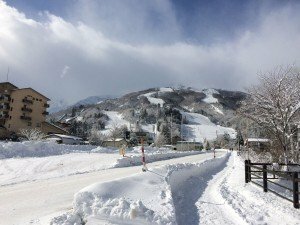 We went to Hakuba where Nagano Winter Olympic & Paralympic were held in 1998 (I was shocked it's been already 20 years..). I didn't feel that cold and I was expecting much more snow, so I was scared about the impact of global warming there.. The first day was sunny and my friend was nice enough to teach me how to snowboard and I think I got much better after 6 hours. On the 2nd day, we had constant snow so soft powder snow protected me from breaking bones or something bad although I fell over (crashed over?) so many times... I guess I improved to the level I feel I'm proud of (maybe not for other people!). I was very surprised to see so many foreigners in Hakuba!! I was the only one Japanese in a hotel my friend booked. Even 95% of employees there were non-Japanese. I also saw so many non-Japanese people speaking Japanese, and I was shocked to see all the expensive prices for restaurants... but some cheap foods were cheap and there were good free bus services which made me feel wonder.. anyway, it was great going for a short trip doing something new and catching up with my mate.